This crash course in Ratt 'n' Roll shows there's much more to the LA glammers than just "Round and Round". One of the defining acts of the 1980s glam metal era, Los Angeles denizens Ratt exuded the Sunset Strip style of that decade, but for all the visual trappings such as the teased hair, the liberal use of spandex, androgynous make-up, and preening poses, the band backed it up with some especially strong songwriting, which resulted in a string of four consecutive platinum-selling albums. Along with fellow LA peers Mötley Crüe, Dokken, and Quiet Riot, Ratt helped set the pop metal template that countless bands would beat to death between 1983 and 1991, but while the quintet never strayed from that formula, they pulled it off with more style than anyone. It was an extremely appealing package: the girls dug the band's good looks and fashion sense, the guys dug their swagger and their unending supply of sharp riffs, the songs were sexually charged but never misogynist, and everyone across the board was drawn in by hook after wickedly contagious hook, which each single brimmed with. 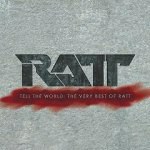 Now, with a successful reunion tour underway, it's as good a time as any for a new career retrospective, and Tell the World: The Very Best of Ratt nicely expands upon the Ratt & Roll 81-91 compilation from 16 years ago. Ratt's songs had tremendous pop appeal, but they also knew how to rawk, and their tunes, 'scuse the pun, always had bite. Unlike the late '80s glam metal wave (Cinderella, Poison, Warrant), which centered on more upbeat riffs and overproduced tones, the LA metal of the early '80s was firmly rooted in classic heavy metal, lead guitarists like Mick Mars, George Lynch, Jake E. Lee, and Ratt's Warren DeMartini giving the music muscle, which offset the pop hooks brilliantly. One needs to look no further than "Round and Round", the greatest single of the pop metal era, a song, for all its perplexing lyrics ("Tightened our belts, abuse ourselves / Get in our way, we'll put you on your shelf") and ridiculously contagious chorus, is built around a nasty, choppy central riff by DeMartini and rhythm guitarist Robbin Crosby, its impact enhanced by a slithering guitar run during each verse. Coupled with the thunderous percussion work by Bobby Blotzer and the exceptional vocal harmonies of raspy throated lead singer Stephen Pearcy and bassist Juan Croucier, it's an impeccable four minutes and 22 seconds. Contrary to what classic rock radio might want to tell you, Ratt's back catalog is much deeper than "Round and Round", and it's the bevy of singles and album tracks that really make Tell the World worthwhile, as the new CD is evenly split between selections from the band's first five albums, with a couple of latter-day tracks tossed in for good measure. The 1984 debut full-length Out of the Cellar remains Ratt's finest piece of work, so it's no surprise that it leads the way with four tracks. Along with "Round and Round", we get the boisterous album opener "Wanted Man", the catchy, funk-infused "Back For More", and the incessant groove of "Lack of Communication". 1985's high-gloss follow-up Invasion of Your Privacy has always been somewhat underrated, but is represented nicely here by the insistent, killer "You're in Love", polished album cut "Dangerous But Worth the Risk", and the sultry "Lay it Down", the latter of which is led by DeMartini's nasty opening riff. Having churned out its first four albums in just over four years, it's no surprise Ratt's albums started to sound increasingly inconsistent as time went on, but the singles remained especially strong. From 1986, Dancing Undercover's "Body Talk" and "Slip of the Lip" took a heavier, more aggressive approach, while "Way Cool Jr." brought a more blues-based, Aerosmith-inspired approach to 1988's Reach For the Sky. Meanwhile, the upbeat knockouts "Dance" and "I Want a Woman" both proved the band could still master the more melodic material. 1990's Detonator veered more toward the more cookie-cutter hair metal sounds of the time, thanks in large part to the songwriting contributions of cheeseball composer Desmond Child, and while his repetitive style is more than apparent on "Lovin' You's a Dirty Job" and "Heads I Win, Tails You Lose", "Shame Shame Shame" manages to exude the kind of energy that Ratt did so well in 1984. Longtime fans might question the exclusion of the single "You Think You're Tough" from the 1983 Ratt EP, but especially when compared to the band's subsequent singles, it sounds much more forced and awkward, and the song is certainly not missed here. Surprisingly, the two "newer" songs hold up especially well; "Steel River", from 1997's Collage is a good reworking song from the band's days in the late '70s, and 1999's "Over the Edge" might do the grungy blues thing that so many '80s bands did during the 1990s, but the sweeping chorus proves that they're still no slouches when it comes to a memorable hook. The competent MTV Unplugged performance of "Way Cool Jr." feels tacked on, and would have been better off replaced by another album track like "You're in Trouble" or "Never Use Love". As the collection stands, though, it's a satisfyingly thorough look back at a garish, yet undeniably fun period in rock history, which considering the doldrums mainstream rock is in these days, is a welcome respite from all the down-tuned drudgery.